Dan presents an interactive program for beginning anglers of all ages. Topics include how to select and use basic tackle, bobbers and cane poles. Dan Armitage, the popular Ohio-based freelance outdoor writer, photographer, radio show host and speaker is a stalwart marine journalist with many credits, and he hosts the weekly radio program “Buckeye Sportsman with Dan Armitage” syndicated in 25 Midwest markets. Armitage is an active member of Boating Writers International, the Outdoor Writers Association of America, and holds a USCG Captain’s license with a 50 ton Master rating. Armitage has been recognized by the National Safe Boating Council for promoting boating safety in his articles, seminars and radio program. Dan’s articles appear in “Outdoor Life”, “Sports Afield”, “In-Fisherman”, “Trailer BOATS”, “Bass & Walleye BOATS”, “Camping Life” and several regional outdoor magazines, and he works with the national “Hooked On Fishing, Not On Drugs” program to conduct educational fishing seminars for youths across North America. His weekly outdoor radio program is broadcast on more than a dozen Midwest stations each Saturday. 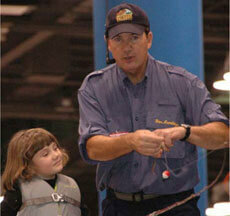 Dan’s popular “Kids Fishing Fun” seminar is an entertaining, educational show involving the children in the audience. In addition to his individual seminars, Dan is the Moderator of the Ask the Pros Seminar Series on both weekends.